Description: Brown (chocolate) frosting quarter that fits over a cake quarter. The frosting is triangular-shaped on top to fit over the top of the cake quarter, and the back is rounded to fit on the side of the cake quarter. Inside of mold is marked "©1987 FISHER-PRICE". Measures 2" tall x 2-5/8" long sides. Description: Round brown (chocolate) cupcake icing/frosting with a round red cherry on top. The bottom of the icing is round and open, the inside of the icing is hollow and marked, "Korea". The top looks like real spread icing. Measures 2" diameter x 1-1/4" tall. Description: Molded brown (chocolate) hard plastic whipped cake frosting that snaps inside the FPT7119 mixing bowl. The frosting is half-circle shaped, the inside has molded whipped ripples that appear to be pushed up around the sides. Has a hole in bottom center (hole has notched edges on sides). Measures 4-1/8" diameter x 1-7/8" tall. Description: Molded light brown (tan) hard plastic whipped cake frosting that snaps inside the FPT7119 mixing bowl. The frosting is half-circle shaped, the inside has molded whipped ripples that appear to be pushed up around the sides. Has a hole in bottom center (hole has notched edges on sides). Measures 4-1/8" diameter x 1-7/8" tall. Description: Round light green (pistachio) cupcake icing/frosting with a round red cherry on top. The bottom of the icing is round and open, the inside of the icing is hollow. The top looks like real spread icing. Measures 2" diameter x 1-1/4" tall. Description: Molded green (pistachio) hard plastic whipped cake frosting that snaps inside the FPT7119 mixing bowl. The frosting is half-circle shaped, the inside has molded whipped ripples that appear to be pushed up around the sides. Has a hole in bottom center (hole has notched edges on sides). Measures 4-1/8" diameter x 1-7/8" tall. Description: Round pink (strawberry) cupcake icing/frosting with a round red cherry on top. The bottom of the icing is round and open, the inside of the icing is hollow. The top looks like real spread icing. Measures 2" diameter x 1-1/4" tall. Description: Molded pink (strawberry) hard plastic whipped cake frosting that snaps inside the FPT7119 mixing bowl. The frosting is half-circle shaped, the inside has molded whipped ripples that appear to be pushed up around the sides. Has a hole in bottom center (hole has notched edges on sides). Measures 4-1/8" diameter x 1-7/8" tall. Description: Small round 1-piece white frosting piece that fits over the FPT7164 small round cake piece. 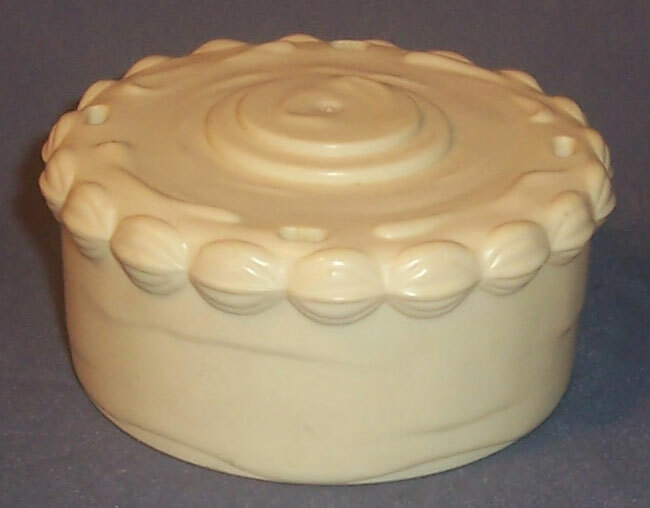 The top is round with molded icing trim on the top edges. Measures about 1-3/4 inches tall x 3-7/8 inch diameter. 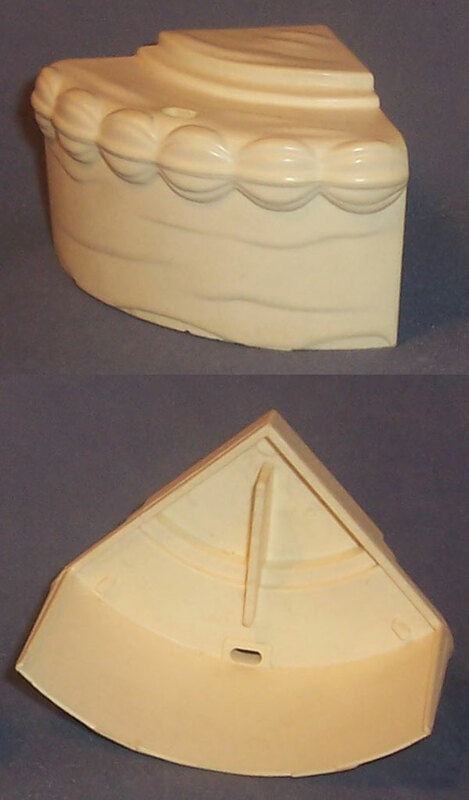 Inside of mold is marked "©1987 FISHER-PRICE". Description: White frosting quarter that fits over a cake quarter. 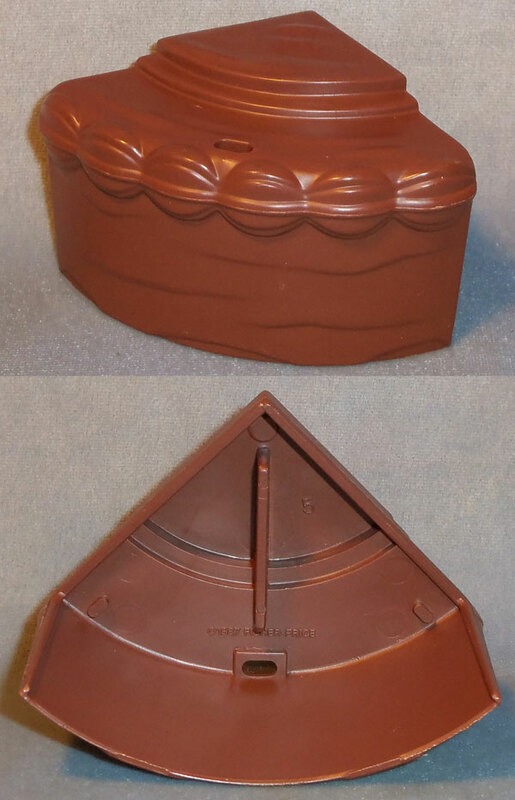 The frosting is triangular-shaped on top to fit over the top of the cake quarter, and the back is rounded to fit on the side of the cake quarter. Inside of mold is marked "©1987 FISHER-PRICE". Measures 2" tall x 2-5/8" long sides. Description: Round white (vanilla) cupcake icing/frosting with a round red cherry on top. The bottom of the icing is round and open, the inside of the icing is hollow. The top looks like real spread icing. Measures 2" diameter x 1-1/4" tall. Description: Molded white (vanilla) hard plastic whipped cake frosting that snaps inside the FPT7119 mixing bowl. The frosting is half-circle shaped, the inside has molded whipped ripples that appear to be pushed up around the sides. Has a hole in bottom center (hole has notched edges on sides). Measures 4-1/8" diameter x 1-7/8" tall.